I was 15 when I learned a truth about my talents﻿—or more precisely, my lack thereof﻿—in one particular area: I couldn’t sing. I’d tried out for a community play, and my a cappella solo sounded so bad that halfway through an accompanist came up and started playing along out of pity. After that, I vowed nobody would hear me sing again. It was time to move on and find another hobby because one humiliating experience was plenty. However, my big brother Dan, who was an incredible singer, had other plans. Months after my audition, he asked why I was so terrified of singing lately. “I’m horrible,” I told him. “I can’t sing.” Dan didn’t believe me. Despite my protests, he convinced me to sing something right there. I was nervous. 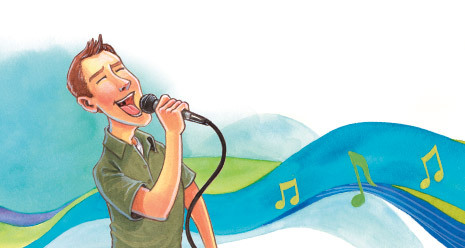 In Doctrine and Covenants 38:25 we are taught to “let every man esteem his brother as himself.” If Dan had made fun of me and my singing, as many older siblings might have done, he certainly would have ensured my singing silence, perhaps for a lifetime. Instead, Dan lifted me up. He encouraged me. In the end, I followed his advice and practiced. To my surprise, I gradually improved. Singing became a great joy in my life. I sang in many choirs throughout high school and then in college and beyond. Singing remains one of my deepest joys. The Savior taught: “Behold, do men light a candle and put it under a bushel? Nay, but on a candlestick, and it giveth light to all that are in the house” (3 Nephi 12:15). I’ve been able to let that light shine, enjoying and sharing music for many years now, but I never could have done it without the encouragement of my brother Dan.